In 2013, Joel Baziuk had a problem. He had too many fishing nets, and no good way to get rid of them. But that was about to change. As operations supervisor of Steveston Harbour Authority, or SHA, just south of Vancouver, British Columbia, Baziuk is responsible for Canada’s largest commercial fishing harbor. At any given time, more than 400 vessels call the harbor home. At sea, they land a plethora of fish and shellfish — from salmon to shrimp to sea urchins — that wind up on dinner plates. All that seafood is caught with nylon nets — seine nets and gillnets that can reach hundreds of feet in length. Many such nets were slowly but surely colonizing every spare inch of storage in Baziuk’s harbor because many have deteriorated to such an extent that they can no longer be used for commercial fishing. “These nets have just been sitting around forever,” says Baziuk. They had deteriorated to such an extent that they could no longer be used for commercial fishing. However, because the traditional disposal options of burying or incinerating the nets are limited and costly, fishermen simply stored their nets instead. As big as it is, clutter is just a small part of the fishing gear problem. In many fisheries around the world, lack of disposal options means old fishing gear finds its way back into the marine environment, where it haunts our oceans as “ghost gear” with devastating impacts. Some 640,000 metric tons (705,000 tons) of fishing gear are lost or discarded in the ocean every year, and each year this gear captures and kills, among other things, an estimated 136,000 seals, sea lions and whales. Since ghost gear accumulates around active fisheries, it can also pose an economic hardship to fishermen as it kills fish or other seafood they would otherwise harvest. But start-up companies capable of collecting and recycling old gear and turning it into market-ready raw materials have recently emerged to help tackle the problem. Since that initial phone call in 2013, Steveston Harbour has recycled over 40 tons (36 metric tons) of nylon fishing gear, with more on the way. Fishing gear recycling is still in its infancy. 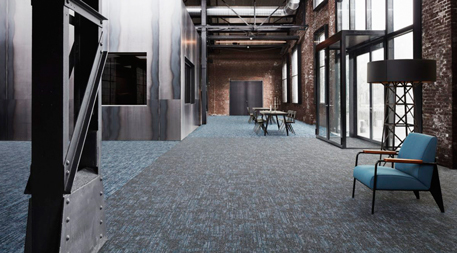 Only two companies, Italian yarn producer Aquafil and Danish cleantech company Plastix, have the technology and resources to do it on a large scale. Both were created in response to the ghost gear problem, and both are now expanding to serve harbors in Europe and around the world. Steveston Harbour began sending its nylon nets to Aquafil’s recycling plant in Ljubljana, Slovenia, in 2014. Aquafil covers shipping costs and pays Steveston Harbour a small sum for the nets. Once in Slovenia, the nets are processed into yarn that can then be made into products like socks and carpet tiles. 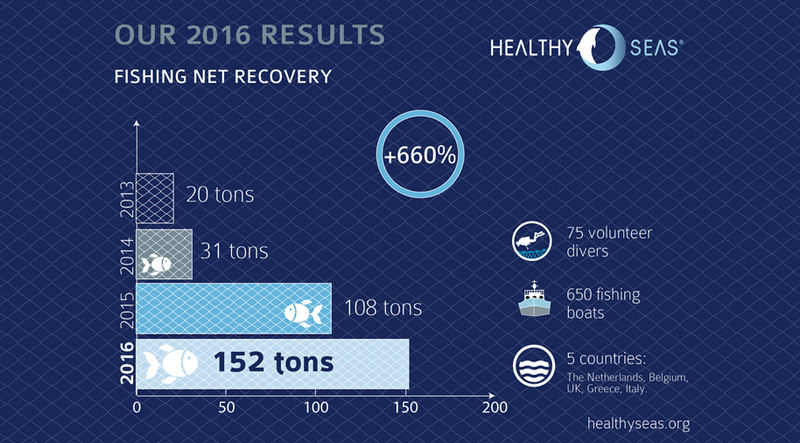 Aquafil has already recycled hundreds of tons of fishing gearsince it began in 2013. Much of this gear has come from the Healthy Seas initiative, a collaboration between Aquafil and other businesses and nonprofits. The initiative’s goals are, in the words of project coordinator Veronika Mikos, “cleaning up the marine environment” and “showing that in [a] circular economy, waste is a resource.” While Healthy Seas primarily operates in Europe — in harbors on the North Sea, Adriatic and Mediterranean — Aquafil’s partnership with Steveston demonstrates that the company is eager to expand. 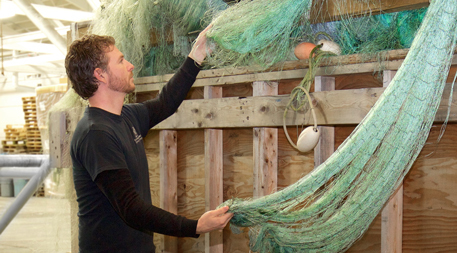 How do thousands of pounds of commercial fishing nets get from Canada to Slovenia? First, fishermen hand over their gillnets and seines to SHA, free of charge. Then, the non-recyclable components of seines and gillnets have to be stripped away to ready the nylon nets for shipping. This work is carried out by fishermen, who are paid for their work out of a lump sum Aquafil gives to SHA. The pure nylon nets are then packed into bags, which will weigh 800 to 1,000 pounds (400 to 500 kilograms) when full. The bags are ready to ship when 40,000 pounds (20,000 kilograms) of nylon have been packed. Unfortunately, since Aquafil only recycles the material nylon6, fishing gear such as trawl nets and crab pots cannot currently be recycled at Steveston. Baziuk says he’d like to recycle all of the harbor’s fishing gear, not just the nylon. Plastix could make this possible. Founded in 2012, Plastix can convert not only nylon6, but trawl nets and metal fishing gear components, into valuable raw materials. It is connecting with harbors around the world through the Global Ghost Gear Initiative, or GGGI. GGGI has been helping harbors like Steveston connect to new recycling options like Plastix. Baziuk hopes to help expand recycling initiatives to more harbors in Canada in coming years. This will require him, GGGI, and companies like Aquafil and Plastix to overcome the two main barriers to fishing gear recycling: logistics and awareness. “Transportation costs are a big problem,” says Baziuk, because small harbors need to pay to move the nets to the larger ports from which recyclers are willing to pay shipping. Giskes agrees. “[A] key component of a successful recycling project is wider availability and access for fishers to disposal and port reception facilities,” she says. Meanwhile GGGI and other organizations, like Circular Ocean, are spreading awareness of fishing gear recycling on an international level. Recycling initiatives are also being connected with ghost gear retrieval programs through initiatives like Net-Works, and Plastix is incentivizing recycling through a newcertification program. Surprisingly, getting the word out locally can be more of a challenge. “Not a lot of fishers these days are connected [to the internet],” Baziuk explains. “Getting information out to people who aren’t necessarily connected is hard.” He says that harbors like Steveston must rely on certain fishermen to act as champions and let other fishermen know that they can recycle their old nets free of charge. The good news is that once fishermen are aware recycling is an option, they have been highly receptive. If Baziuk and the recycling companies can successfully establish collection hubs throughout Canada, the country’s harbors will be recycling long after Steveston sends off its last old forgotten net. And, eventually, net recycling just might catch on around the world. This article has been taken from Ensia. (Rachel Fritts produced this feature as a participant in the Ensia Mentor Program. Her mentor for the project was Marc Gunther).